From the Canada lynx living deep in Maine’s spruce-fir forests to the freshwater mussels found in the Tennessee River Basin in Virginia, thousands of species have found their niche in the Northeastern United States. Some are common, some are game species, and some are on the brink of extinction, but all depend on regional habitats to survive. The resources sustaining these species also provide essential benefits like clean water to the tens of millions of people who make their home in the Northeast. It is the most densely populated region in the country, yet it is a place where people and nature have long coexisted. The Northeast is a mosaic of communities, working lands, open spaces, and protected habitats, and a place where our history has been shaped by our relationship to the land. But land use and changing environmental conditions are threatening the natural places that define us, the resources we depend upon, and the wild things and places we care about. To sustain these valuable natural resources into the future, we need to work together. In response to these threats, the North Atlantic Landscape Conservation Cooperative (LCC) and the Northeast Association of Fish and Wildlife Agencies (NEAFWA) coordinated a team of partners from 13 states, the U.S. 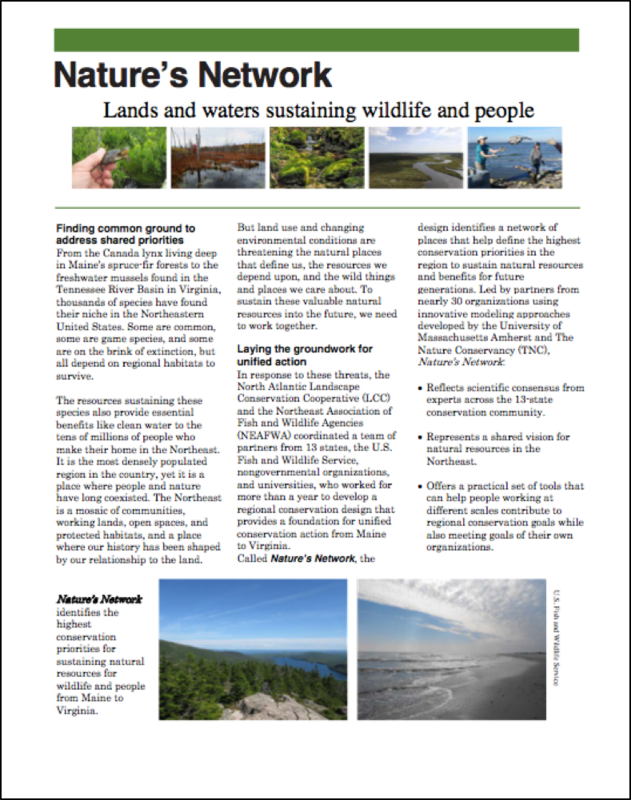 Fish and Wildlife Service, nongovernmental organizations, and universities, who worked for more than a year to develop a regional conservation design that provides a foundation for unified conservation action from Maine to Virginia. Reflects scientific consensus from experts across the 13-state conservation community. Represents a shared vision for natural resources in the Northeast. Offers a practical set of tools that help people working at different scales to contribute to regional conservation goals while also meeting the goals of their individual organizations. Conserve the irreplaceable – The best place to start strategic conservation is to identify a network of connected, intact, and resilient areas encompassing various types of lands and waters representing important habitats for key species. These are priority places for future sustainable human and natural communities in the Northeast. Make better decisions for the future – Guidance that reflects projections about how land use and environmental changes will affect natural resources over time can help us safeguard today’s investments in conservation for future generations. Maximize limited resources – Conservation agencies and organizations have limited time and money to invest in protecting natural resources that wildlife and people depend upon. Guidance grounded in science and supported through regional collaboration allows more efficient use of limited resources in the face of complex environmental threats. Support local priorities with regional perspective – Seeing how local conservation efforts fit into the bigger regional picture can help connect local, state and regional priorities. By zooming out, practitioners working at any scale can discover new opportunities that warrant a closer look. Find opportunities to work together – Sustaining fish, wildlife, and natural resources in the face of increasing threats is beyond the scope of any single agency. With the benefit of consistent regional information, partners can look across state borders for opportunities to work together towards shared conservation goals at scales that matter for wildlife and people. 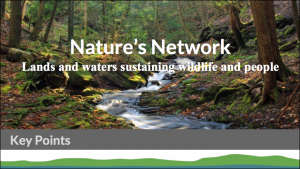 Ready to see where you fit into Nature’s Network? Visit the Data & Tools page to explore.